How Do I Manage Bleeding Wounds? Melissa McKee, DVM, offers advice on managing bleeding wounds. Sooner or later, every horse owner is going to have to deal with a wound, or wounds, from first aid through to the final healing stages. Fortunately, horses are very accomplished healers, which is terrific because they are also very accomplished at getting into trouble. By providing prompt first aid and maintaining the basic principles of controlling hemorrhage, gentle tissue handling and cleanliness, you will set your horse up for a successful and hopefully uncomplicated resolution of the injury. While many minor wounds do not require additional care, there are a few situations where veterinary attention is critical. If you are ever in doubt, call your vet right away for advice. It is easier to prevent most serious complications than to try to deal with the consequences of an improperly treated injury. The first indication of a laceration is usually the discovery of blood somewhere on the horse. Some wounds will bleed very extensively and if an artery is severed, it can squirt out in pulsations or a constant stream. Try not to panic. Horses have a very large circulating blood volume – an average-sized horse has 35 litres – and they can lose up to 15 per cent of this amount, or about 5.25 litres, before showing any signs of hypovolemia (shock due to blood loss). That’s more than five standard-sized milk cartons. If the hemorrhage is very slow, they can compensate for even greater losses than that. If you discover a horse with a big, rapidly bleeding wound and you cannot tell from the immediate environment how much blood they have lost, once you have called the vet and initiated first aid to control the hemorrhage, there are a few things you can check to determine if you are dealing with extreme blood loss and shock. Horses that are in shock are usually quiet and a little weak on their feet. Their gums will be very pale and take longer than three seconds to return to pink after you press on them firmly with your thumb. Normal heart rate in a horse is 24-40 beats per minute. 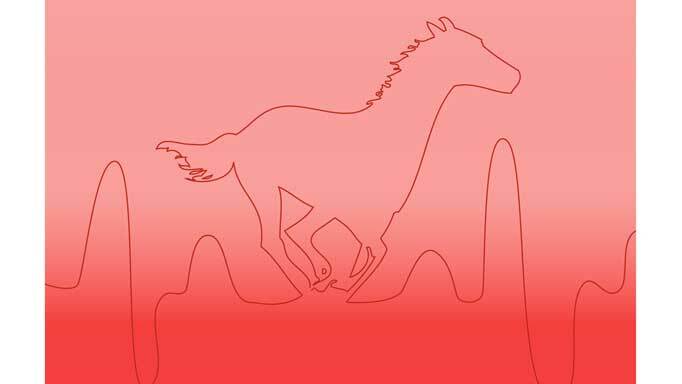 While pain and anxiety will have caused some elevation, horses in shock from blood loss will have a very rapid heart rate, the peripheral pulses will be weak or impossible to palpate. Respirations will be notably increased and shallow, and the extremities will become cool. In severe situations, the horse will be too weak to stand. 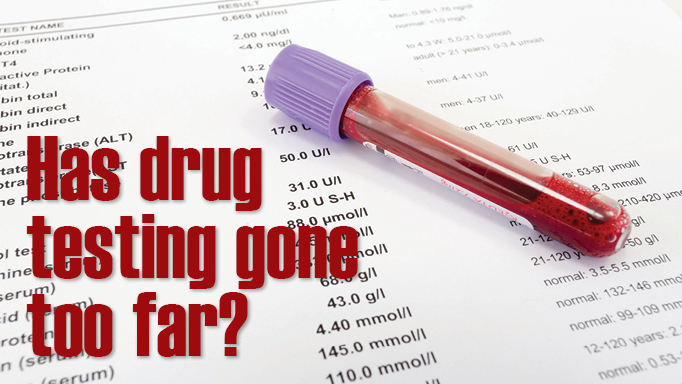 Blood loss does not necessarily have to be external for shock and death to occur. Damage to large blood vessels can cause fatal internal bleeding as well. The most common instances of this are uterine artery rupture during foaling and laceration of the femoral artery or aorta from a fractured pelvis or femur. If you notice any of the signs of severe blood loss, make sure you alert the vet, who is hopefully on her way. Vets on emergency duty often have to “triage” their calls, meaning that they attend to serious and life-threatening situations on a priority basis regardless of what order the calls arrived in. Evidence of hypovolemic shock is critical information for these decisions. Fortunately, this is a very rare occurrence. The majority of fresh wounds will benefit from some form of hemorrhage control, but the horse is not at risk of succumbing to acute blood loss. The key to stopping blood flow is to apply very firm direct pressure over the site with a clean towel, gauze square or maxi pad. Try to avoid the urge to constantly peek under the bandage because releasing pressure on the vessels prematurely will dislodge the developing clot. If the blood is soaking through your pad very quickly, add a few more layers and apply a very tight non-adhesive bandage, such as Vetrap™, over top. 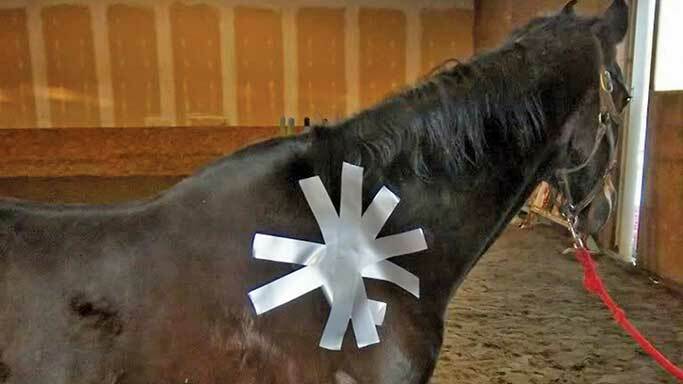 Try to keep the horse quiet and still to help lower blood pressure and movement at the wound site. With the amount of padding used and relatively short duration the bandage is in place (hopefully it’s not long before the vet arrives), this will not approach that kind of pressure and flow restriction that a traditional tourniquet would create. I don’t recommend using tourniquets in these circumstances because the pressure being applied around the limb, to the skin and underlying tissues, is transferred to the walls of the blood vessels, causing blood flow to be cut off temporarily. Obviously, dramatic hemorrhage is a clear indication to call the vet out. There are, however, other, often more subtle, wounds that require professional attention. Any wound over a joint or tendon sheath should be evaluated for possible penetration of a synovial structure. In some cases, it is obvious on visual inspection of the area, or the observation of synovial fluid draining from the wound. Sometimes the vet will have to inject the joint or sheath with fluid at a separate location and watch for this fluid emerging at the wound site. All penetrating injuries to joints and tendon sheaths require aggressive flushing, antibiotic treatment, and, occasionally, surgery to ensure that infection does not establish. Sepsis can result in devastating career-ending and sometimes life-threatening consequences. Early intervention greatly increases the chance of a successful outcome. If you find a large foreign object embedded in a wound, such as a stick, nail, or glass, do your best to wrap around it and leave it in place until the vet arrives. It can be surprisingly difficult to determine the extent of a foreign body penetration once it has been removed, and it may also be holding off a blood vessel that will bleed copiously if that pressure is removed. This is especially true for the dramatic fence-post or rail penetration of the chest or abdominal cavity. If you can, try to saw off the protruding rail close to the horse while leaving the rest in place. Small wounds resulting from a kick on the forearm and thigh, especially on the inside of the limb and if the horse seems unusually sore, should receive veterinary attention. In some of these areas there is only a layer of skin over the bone, with little flesh to cushion and protect it from trauma. The high impact force of a kick will carry enough kinetic energy to cause a hairline fracture in the radius or tibia. These horses often seem sore for a day or two, then are normal until sometime in the next few weeks when the fracture line breaks completely through while they are getting up in the stall or having a play outside. Early identification of the hairline on x-ray allows for stall rest in crossties to prevent this tragic outcome. Small wounds on the outside of the hind cannon bone also deserve an x-ray because the hind lateral splint is very fragile and fractures easily when kicked or when the horse is kicking something. Broken or exposed bone observed at the injury site. Full thickness skin injury more than a few centimetres long, especially if they create a pocket that will trap debris. Wounds that need trimming or debridement. Any eyelid laceration. Eyelids are precious and should be stitched whenever possible to avoid life-long corneal irritation. Even ones that are hours to days old can often be saved. Non-weight bearing lameness, even if the wound is small. Old, unattended wounds that are infected, painful or have excessive proud flesh. Hopefully you will only have to deal with a superficial scrape or some road burn from adventures on turnout. Once you have stopped or reduced the bleeding to a slow ooze, you can proceed to gently clean and explore the damage more thoroughly. The key to wound management is the saying: “dilution is the solution to pollution.” That means copious rinsing with saline, or less ideally but quite adequate, clean tepid water. Sterile saline is the preferred fluid for cleaning. In addition to the cleanliness of bottled saline when compared to most well-origin barn water, it is “isotonic” to natural body and tissue fluids. This means that it will not create tissue edema by overhydrating it the way pure water will. If you hose down a large fresh wound, you may notice that the exposed flesh becomes slightly swollen and jellylike with a glistening, faintly white appearance. Since water is more dilute than our blood, serum and tissue, water molecules will tend to diffuse into the wound, giving it that waterlogged appearance. Saline, on the other hand, has the same concentration of dissolved material as our own systems, and will not cause this effect. “Hypertonic” saline, that has an even higher concentration, will actually draw fluid out of tissue. That’s why drinking seawater will worsen dehydration. Although saline is the “gold standard,” the reality in most cases is that you will have to use regular tap water. It is important that you gently rinse away as much contamination as possible. Ultimately, debris and bacteria are more harmful than a little excess water in the tissue. Mix Betadine® solution into your water or saline at the rate of two to three millilitres per litre of fluid, to provide a mild antiseptic effect that won’t harm the tissues. A 35ml syringe with an 18-gauge needle attached provides the ideal pressure for flushing small pockets and contaminated areas. Use a soaked gauze 4×4 square over your fingers to pick out gravel, dirt and other contaminants, if necessary. Once you have tidied up the injury as much as possible, and have a better view of the situation, carefully reassess the wound for the need for veterinary involvement. Punctures (once cleared by your vet) and very contaminated wounds often benefit from a few days of wet lint poultice (such as Animalintex) to continue the cleansing and debriding process. If everything looks okay, apply an appropriate topical dressing and, if possible, apply a clean non-adhesive pad and protective bandage over the area. Minimizing movement, contamination, fly traffic, irritating and caustic wound dressings and ongoing trauma from bedding and other environmental factors will help the injury to heal as rapidly and cosmetically appealing as possible with minimal proud flesh. A rule of thumb for topical wound treatments is never put anything in a wound that you wouldn’t put in your eye. That narrows it down considerably to creams such as Polysporin®, silver sulfadiazine and Derma GeL®, honey and combination products like Panolog® and Special Formula. Never use caustic or drying powder on wounds, they harm the healthy skin that is trying to migrate across the wound and promote the formation of proud flesh. Taking proper care of a wound during the initial stages, seeking veterinary guidance if necessary, is the key ingredient to rapid healing and minimal scarring. Control bleeding, clean thoroughly, use gentle topical dressings, and protect with a bandage whenever possible. 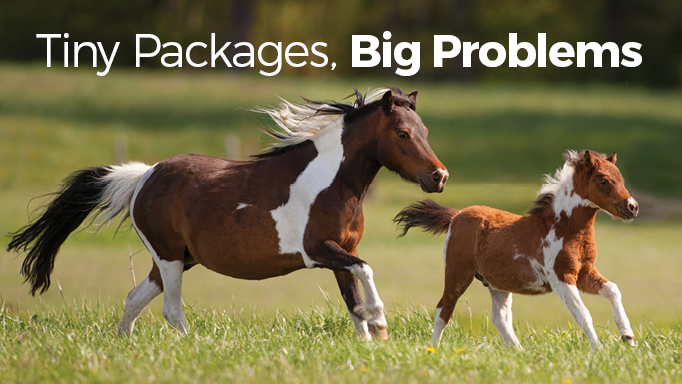 Health issues in miniature horses. 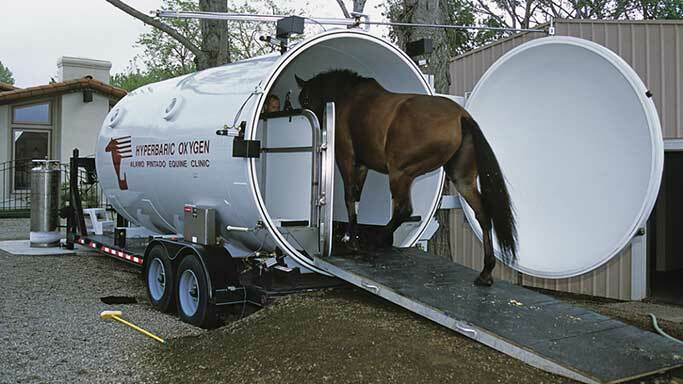 Hyperbaric Oxygen Chamber Therapy: Magic Bullet or All Hype?